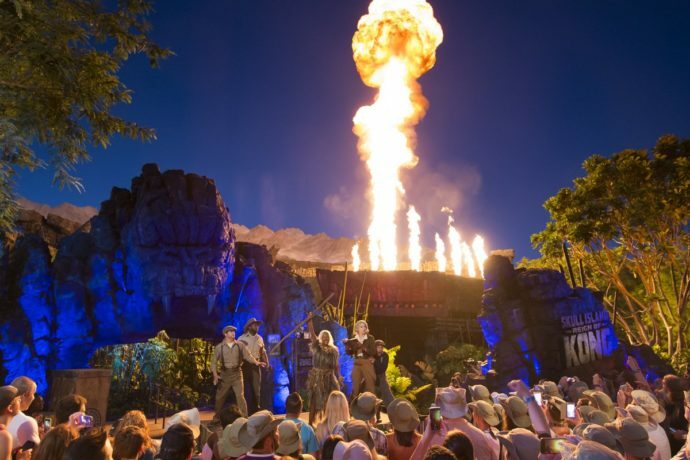 Universal’s newest attraction, Skull Island: Reign of Kong at Islands of Adventure is now officially open! The announcement was made during the Today Show with Al Roker and Tamron Hall earlier today. It has also been tweeted by Universal Orlando with them saying “Skull Island: #ReignOfKong is now open at #IslandsOfAdventure!” The attraction has been in soft open, or ‘technical rehearsals’ as Universal calls it, for a full month, but as of now will be officially listed as open in the Universal Orlando app and map, and will (hopefully) be open all day along with the rest of the park (starting tomorrow). You can see the official opening ceremony from earlier this morning below along with some more images as well. Check out our extensive coverage of the construction of Kong since the beginning here, and stay tuned for more theme park news and updates coming soon! Be sure to check out our last Kong update with video and photos from the soft opening and queue walk-through, and see all Kong updates here. Subscribe to the feed so you never miss a new post! Stay tuned for more park news coming soon!